Progiene is committed to optimal herd health and the production of top quality milk. Mastitis, lameness and poor fertility remain the key income-draining problems on UK dairy farms, but sound hygiene routines and the use of high quality dairy hygiene chemicals often make the difference between profit and loss. Drawing on the latest market feedback, the innovative Progiene range of quality teat dips, circulation cleaners, and hoof and bedding hygiene products has been developed to meet current dairy farmer needs as closely as possible. Premium quality and effectiveness come as standard and all products are manufactured in accordance with ISO 9001 and GMP protocols. 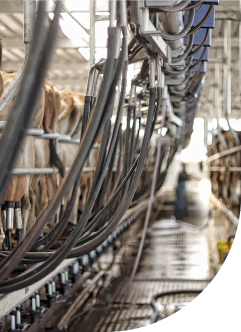 Our innovative range of quality teat dips, sprays and foams, circulation cleaning detergents, bulk tank cleaners, cluster disinfectants, hoofcare and bedding conditioners has been designed to offer cost effective milk quality solutions whatever your particular farm circumstances. Our UN Approved packs are available in 5, 25, 200 and 1,000 litres and can be delivered direct to your door.